As Stewards we frequently come across situations where interpretations of a rule are different amongst our Stewarding teams. This Photos page with be strictly for discussion purposes only....so please discuss at your next Steward's meeting. Stewards Hub will not be publishing any rule clarifications. If you have a photo that you are interested in submitting related to officiating please send the .jpg to info@stewardshub.com. Please DO NOT SEND photos or images of competitors or other officials without a written consent agreement of 3rd parties included along with submission. 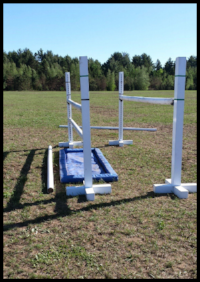 Oxer with Liverpool and Ground Line - Is this fence Legal per FEI or Equestrian Canada Rules???? The Stewards Hub is not responsible for, and expressly disclaims all liability for, damages of any kind arising out of use, reference to, or reliance on any information contained within the site. While the information contained within the site is periodically updated, no guarantee is given that the information provided in this Web site is correct, complete, and up-to-date. Although the Stewards Hub Web site may include links providing direct access to other Internet resources, including Web sites, The Stewards Hub is not responsible for the accuracy or content of information contained in these sites. Links from Stewards Hub to third-party sites do not constitute an endorsement by Stewards Hub of the parties or their products and services. The appearance on the Web site of advertisements and product or service information does not constitute an endorsement by Stewards Hub and has not investigated the claims made by any advertiser. Product information is based solely on material received from suppliers.